Chiropractic patients were 3 times more satisfied with their care than patients of family practice physicians. (Western Journal of Medicine – 1989). At the Spinal Health and Wellness Center, we utilize the Segmental Drop System for Chiropractic Adjusting. This system utilizes a precision adjusting table with individual drop pieces. The drop pieces on the table create a force in the joint and/or soft tissue that produces the desired change in spinal alignment. This technique reduces the force needed to adjust the spine, which reduces the reaction to the patient. The result of this technique is a precisely directed low force adjustment used to improve the alignment of the spine. "It can be a mistake to assume the problem is at the place where you feel the pain..."
A myofascial trigger point is a group of muscle fibers that stay in a contraction without relaxing. A trigger point in a muscle could be causing pain or it could manifest no pain at all unless touched. A trigger point has the ability to send pain into other areas of the body – this is called referred pain. Trigger point researchers believe that everyday pain is caused by myofascial trigger points and that ignorance of that basic concept could inevitably lead to false diagnoses and the ultimate failure to deal effectively with pain (Travell and Simons 1999, 12-14). In the Trigger Point Manual, Travel and Simons list 24 examples of mistaken diagnoses that are likely to be made when the physician is unaware that myofascial trigger points may be to blame. Trigger points can develop in any of the 200 pairs of muscles in the body. Trigger points develop as a result of activities that damage or overload muscles such as accidents, falls, lifting or carrying heavy loads, exercising when out of condition, abnormal posture and/or repetitive activities. Trigger Point Therapy is a type of deep tissue massage that works by stretching the muscle fibers of the trigger point and causing the fibers to relax. 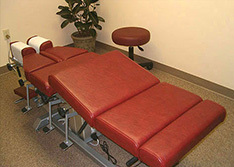 This therapy is used in our office as a supplement to the chiropractic adjustment and rehabilitative techniques. The Posture Print System is an assessment tool that is used in our office to analyze posture. The program uses digital photography and innovative computerized technology to create a report that outlines postural deviations and recommends a personalized exercise program. The report and exercise program is used to establish a rehabilitation program that is specific to each individual patient. The system is completed during the initial visit as part of the new patient examination and is used again during re-examination to measure correction. At the Spinal Health and Wellness Center LLC, we know how the feet are the foundation of the entire body. 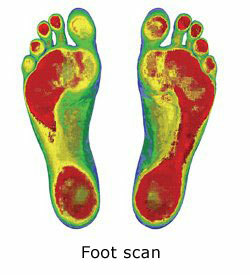 Any fallen arch or misalignment in the feet can cause pain (now or later) in the knees, hips, back and neck. We use The Associate Platinum foot scanner to examine your feet and each of the foot’s three arches and show you a color photo of your feet. The Spinal Pelvic Stabilizers are custom-made orthotics designed to support all 3 arches of the foot. By providing proper support for the feet and creating a balanced foundation for the body, the stabilizers assist in improving spinal alignment. Your lifestyle, age, weight, activity level and spinal condition are also considered in the construction of the orthotics. Exact measurements of your feet are taken from your digital foot scan when we create your pair of Stabilizers, so they are as unique as you are. The purpose of spinal rehabilitation is to restore muscle balance/symmetry, increase muscle strength, and increase muscle endurance. Overtime, muscles surrounding the spine become imbalanced. Some muscles become tight and tense while others become stretched and weak. These muscle imbalances predispose people to musculoskeletal problems. When muscles become imbalanced they alter movement of spinal joints leading to joint fixation or instability. Without restoring muscle balance and symmetry, joint imbalances will remain. This is the logic behind using spinal rehabilitation techniques in addition to the spinal adjustments. A joint that is surrounded by imbalanced muscles will continue to become misaligned. On the other hand, if the muscles around the joint are balanced, the joint will stay aligned after being adjusted. 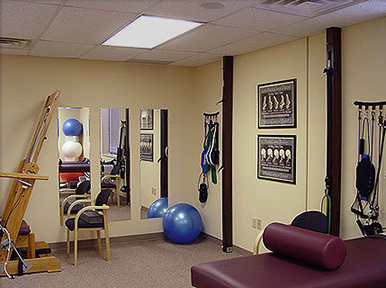 Our office uses resistance bands, therapy balls, and traction to rebalance the muscles in and around the spine. Dr. White provides specific recommendations on nutrition and nutritional supplements in order to address the health of the whole body. She embraces the concept of "Biochemical Individuality: “the concept that the nutritional and chemical make-up of each person is unique and that dietary and other needs therefore vary from person to person.” Our office utilizes whole food supplements from Standard Process and herbs from MediHerb. Please call our office to schedule a nutritional consultation.